Having made a remarkable impact on the yachting world, the FOILER flying yacht is set to continue its skyward trajectory in 2019. Initially having its world debut at the UAE’s biggest marine event, ENATA will be using the first anniversary of the FOILER’s launch to showcase some significant technical and design developments on the flying yacht at the upcoming Dubai International Boat Show (DIBS) from 26 February – 2 March. The new generation of FOILER will be on display for the duration of the DIBS 2019, and remaining in the region after the event for client’s and media sea trials. The layout of the yacht on display will showcase one of the new – the stylish Royale, the fun-loving and family-friendly Azure and the adventurous GT– with final details set to be revealed at the boat show itself. More than 1,000 hours of extensive testing of the FOILER’s pre-production model in real-world conditions during the 2018 Mediterranean summer season resulted in this client-ready version of the yacht. The company has used results from this testing process to make various improvements to performance and design for the newest generation of FOILER yachts. 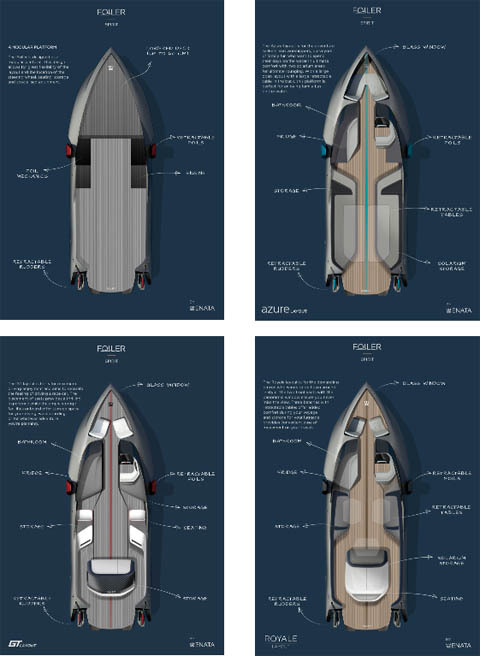 The latest developments in the 2019 FOILER design include a new 740 hp hydrostatic propulsion system that is even more efficient than the previous model. This trailblazing version provides another 20% increase in fuel efficiency at top hydro-foiling speeds above the previous model, bringing overall fuel efficiency about 40-50% greater compared to a traditional yacht. There have been improvements to the design of the hull and the FOILER’s unique hydro-foils. Additionally, the model set to be on display at the 2019 DIBS will showcase a new layout and finish. The vision behind ENATA’s FOILER was to create a luxury yacht that delivers a smooth, quiet and exhilarating ride for passengers alongside a comfortable, high-performance driving experience. The push-button controlled retractable carbon fibre hydro-foils combine strength, rigidity and lightness, allowing the yacht to fly 1.5 metres above the water through fast, efficient propulsion. The FOILER yacht is capable of travelling at speeds in excess of 40 knots (75km/h),with hydro-foiling flight commencing from 12 knots and full flight at 18 knots with seven passengers and a driver. With various design variations, its modular layout allows for a wide range of tailor-made adaptations to suit a client’s specific needs while retaining the unique DNA of the FOILER.